We find inspiration in nature. We believe that nature is not just something to be cherished but something to emulate as a model of sustainability. We know that healthy environment and healthy economy are closely linked. We are committed to working towards these ends by stating our values and acting as agents of change along with our families, friends, associates and the whole wider community. 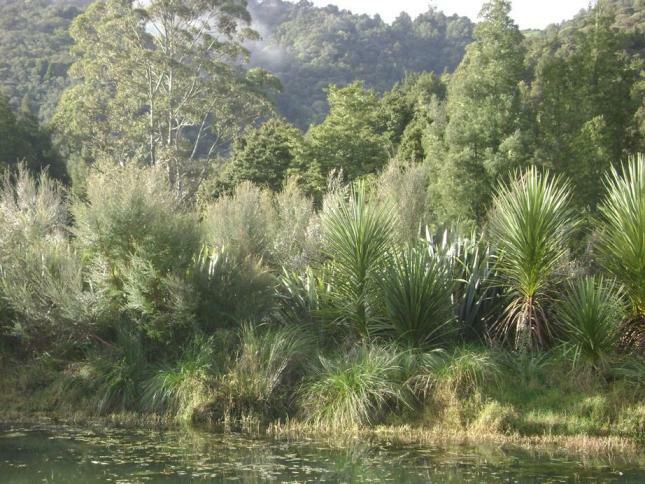 As specialist native plant seed collectors,we have been carefully observing plants provenances and natural habitats throughout New Zealand and its offshore islands for decades. We have a practical understanding of most plants’ particular needs as well as being skilled in methods of planting, establishment, pruning, nutrient requirements and, when necessary, eradication. As landscape designers we emulate the natural environment. By repeated observation, we have come to develop an understanding of how to best integrate plants into man-made landscapes. As nurserymen, we supply not only the general public, but also other nurseries with growing on lines and seedlings. Our plants have an enviable reputation for quality due to our incessant drive to improve our product. As employers we foster the education of our employees and have put several people through apprenticeships. We regularly educate visitor groups from other horticultural courses. Forest Floor Ltd is a company owned and directed by Simon Vallings. The formation of the nursery was conceived in 1993 and has now developed into a well established and sustainable company. Primarily through the experience and enthusiasm of its principals and the team of professionals the company employs, the nursery has gained an enviable profile and reputation for the propagation and supply of high quality, healthy native plants at remarkably economical prices. Many years ago we recognised the potential of Leptospermum scoparium (manuka) for revegetation work and as a valuable native plant in its own right. Simon is keen to impart his enthusiasm for New Zealand’s natural wealth. He aims to develop widespread recognition of the long-term benefits that native flora and fauna can bring to our existing and ultimate ecological environments. The above photo shows a manuka plant (Leptospermum scoparium) growing on the wharf at Opua. This clearly demonstrates the role manuka has to play as a native pioneer in Northland. Perhaps only pohutukawa (Metrosideros excelsa) (on the left) can match it for hardiness on the coast. Both plants are icons of the Northland region, and both are from the Myrtaceae family. For the last 25 years we have been extolling the virtues of native plants such as these. We have been pointing out that manuka is a superplant, worth 100's of millions annually to the New Zealand economy, not just for preservation of topsoil and prevention of erosion, not just for its role as a pioneer in getting native bush going, but also for medicinal oil, firewood, sawdust for smoking meat and fish, and of course for its honey. It is gratifying indeed to see the increased recognition manuka is receiving. Our Northland nursery has produced well over 1.5 million manuka trees so far, and 1.5 million other species of trees, as plantable plants, not counting the millions of seedlings we have supplied to other nurseries. Our vision for the future is that we would like to continue to supply quality trees to Northland, and we will continue to find new species to grow that are as neglected as manuka once was....such as kumerahou and hange hange, and try to get them recognised as superplants too.